In a blind tasting of eight blended whiskies, the sheer quality of the grain and malt in the Blue Label permeated in the glass and wafted up strongly but with elegance and grace. In the dense cloud of dry smoke and malt is the bright glow of blackberry and licorice with shavings of oak and a drizzle of honey which move seamlessly onto the palate with sprouts of mild peat and cocoa over rich orange which finish strongly as the bouquet of flavours evaporate leaving the charactertstic dry smokiness of Johnnie Walker tingling on the tongue. The finish is a little disappointing on consecutive tastings, though, because it fades quickly. This is the main negative, I think. I still prefer the Black Label and Green Label I sampled to this Blue Label. Are the results in Bottle No LA764397 spectacular? Not really, but they are very good! Some blends cater for the general market, and I think the Blue Label is one such blend which is very smooth and drinkable. I will taste other, more recent, Blue Label to compare and see whether anything has changed. I open the box with a smile, knowing that whatever the quality of the contents of this bottle, I am about to taste “the finest and rarest of the Walker reserves”. 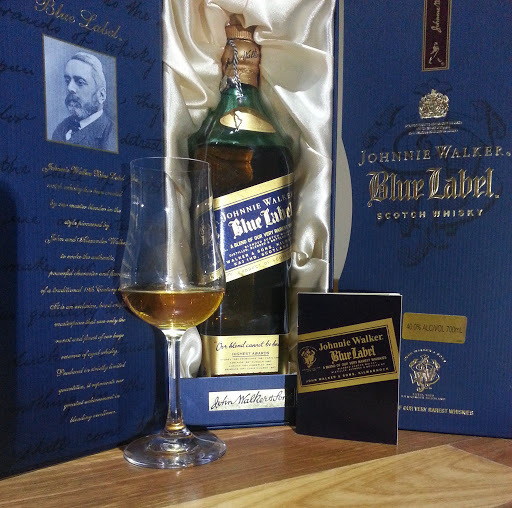 The Blue Label is described on the box as a blend of Johnnie Walker’s “very rarest whiskies”. This is definitely a whisky that I have wanted to try for many years. Of course, “rarity” should not be confused with quality but “rarity” by its very nature has value. 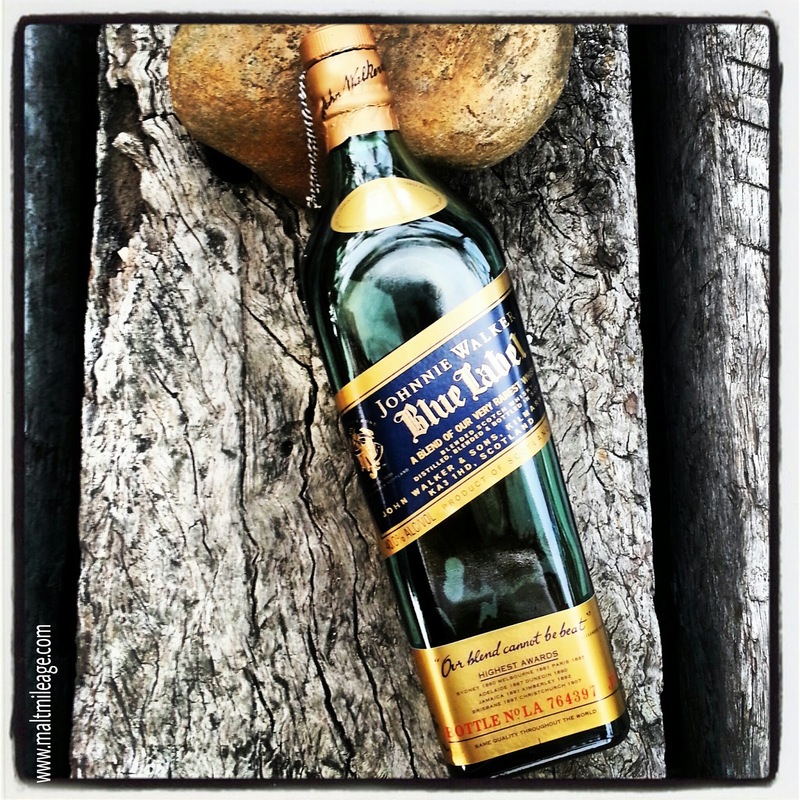 Opening a bottle of Johnnie Walker Blue feels like a big deal. Sweetness shines through a fog of dry smoke, malt and some bitter oak, releasing beams of blackberry and licorice. It is soft and light on the nose, and yet heavy with a decent weightiness. There is some spice on the nose as well. The Blue Label bursts on the palate into a symphony of old and young grains showcasing what I consider the best yet of the Johnnie Walker distillery. There is so much happening as the character moves almost seamlessly from the nose. Light wisps of diverse peat meet the tongue, lush green, moss, burnt twig and dry grass. Then a dense licorice adds some substance as sweetness enters in the form of dense orange cake drizzled with extra old brandy and dashes of maple syrup accompanied with shavings of dark chocolate and orange peel. This whisky is sensational. It is not overly sweet, and the peat beautifully balances against the bitter oak and sweetness. Then toffee apple forms on the tongue, as a gritty raw sugar sits on the tip of my tongue. The Johnnie Walker Blue Label deserves lots of unpacking, because it is an extremely complex whisky with lots of character to explore. Just the complexity of the peat alone makes this whisky worth tasting! The oily and velvety texture coats my tongue with heavenly Johnnie Walker goodness, but then it evapourates as quickly as it comes. So disappointing. This whisky is complex and has a level of depth which can keep you peeling off layers for a long time! Nose after nose, sip after sip, I am left thinking and wondering what has gone into this blend. It sparkles brightly at the most unexpected times. The more I become familiar with this blend it becomes abundantly clear that what I smell is the lovely uniqueness of the Johnnie Walker Blue which is a fusion of different whiskies by a master blender. Do not expect the pungency, potency or power of some single malts (which in my opinion can sometimes be overpowering). Expect complexity, softness, smoothness, depth, subtlety, warmth. Johnnie Walker Blue Label taste is my favourite.any whisky I have ever tasted.